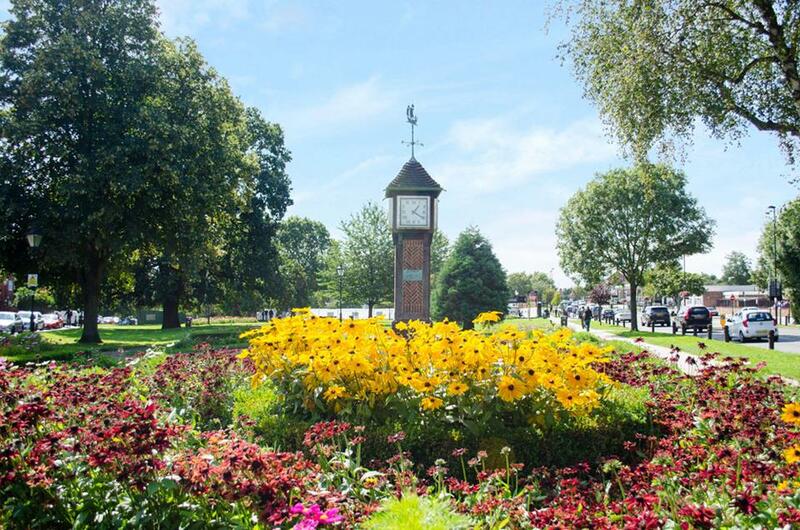 NorthoIt is found on the north-western outer ring of Greater London When considering where to live in London, Northolt is often an overlooked suburb but it has several parks, a gym, golf practice range and community centers. Northolt is mentioned in the Domesday Book as being held by Geoffrey de Mandeville, and archaeological evidence suggests that there was a Saxon village at the location from the 8th century onwards. The medieval village had its origins in the Saxon period. Up to late Victorian times, the area was rural with predominantly arable crops being grown. The fourteenth century Northolt Manor existed behind the present Court Farm Road and was excavated from 1950 onwards. A barn constructed in the area in 1595 can now be seen in the Chiltern Open Air Museum. In the early part of the 18th century farmland was enclosed in order to provide hay for the City of London, alongside more traditional crops such as peas and beans. Suburban development began in the 1920s. Most of the housing north of the Western Avenue was built in the 1920s-1930s, and is in the private housing sector. Most of the housing built to the south of the Western Avenue was built in the 1960s-1970s, and is in the public/social housing sectors, particularly along the Kensington and Ruislip Roads. Northolt is an incredibly culturally rich place to reside, since the borough is home to a variety of different ethnic and religious groups. For good shopping, bars and restaurants, Ruislip, Ealing and Harrow are close by. Northolt is considered a great commuter’s choice for a place of residence since there are good transport links into Central London and its surrounding areas. The popular modern A40 road directly into London is easily accessed from the area via the Target roundabout which is often commented on in broadcasts and traffic updates. The Northolt Tube Station is serviced by London Underground’s Central Line, the Northolt Park railway station is a Network Rail station. It is in Cadogan Close and spans the boundary between the London Borough of Harrow and the London Borough of Ealing, with a footbridge connecting the north side (leading to Roxeth and South Harrow) to the south side (leading to Northolt and Greenford). Landmarks of Northolt include the various churches, including the marvelous Saxon church of St. Mary's (14th Century), set on a green slope in Northolt Village, a Conservation Area. This is a hidden gem with a village green, and a brook running through it, a large thatched pub and restaurant. The village Clock tower in the center of the village is a freestanding clock tower erected to commemorate the coronation of George VI in 1937. Northala Fields is main focal point of Northolt and Greenford Countryside Park. Developed with rubble from the old Wembley Stadium these conical man made hills acts as a sound barrier from the A40 for the ponds and park life sheltered behind. The new facilities at the Northala Fields development include water features, picnic areas and play facilities for children.